Get serious with your design. 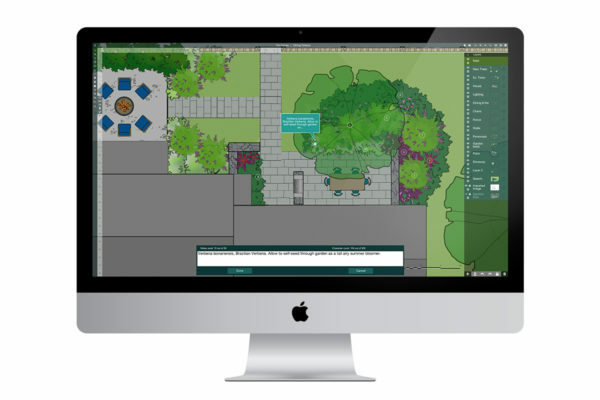 We created the Home Outside landscape design app as an easy-to-use alternative to highly technical CAD-type design programs. 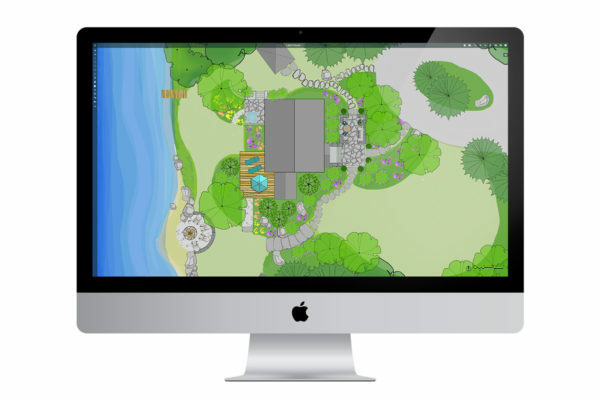 It’s an intuitive tap-and-drag app with over 700 hand-drawn elements that homeowners and design professionals can use to create a property plan or garden layout. Design with 700+ elements in landscape or portrait orientation within a dynamic full-screen application window. Get into the details with greater dexterity and control with a cursor and keyboard shortcuts. Download your design files and plans directly to your computer’s documents. Designs also save automatically to your Gallery. Designs can be created, opened and revised in both mobile and desktop. Use Layers more effectively with an in-screen Layers panel. Adjust the opacity of each layer with a slider and merge layers. Import a JPG or PNG from your files as a layer in your design. Adjust the size, location, rotation, and opacity. Useful for using a property survey or architectural plan as a guide. Select from pre-set design areas. Margin rulers and a dynamic scale bar display in feet or meters. Satellite image scale and design scale sync when you import a map image. Add up to 50 text notes with up to 300 characters each corresponding to positionable number tags in your design. Note text auto-formats to display on PDF. Format your design and notes to display as a 1-4 page 11×17″ full color PDF. Customizable design info displays in PDF titleblock. 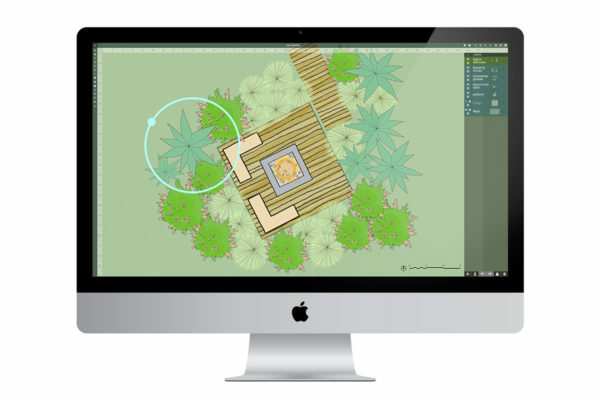 With desktop, you can create designs in portrait or landscape orientation. Using a cursor and keyboard instead of a mobile touchscreen, you can craft the details with greater precision and control. When you’re finished designing, choose a layout and print a full-color PDF of your design and notes. Why buy the Home Outside desktop app? How do I send my design file from the Home Outside desktop app to the free Home Outside mobile app? Designs created with the desktop app are compatible with the mobile app and vice versa. Select a design in your Gallery and click the Save button to save a design file (.pdesign) to your personal computer. To transfer this saved design to your mobile device, use Apple’s Air Drop; an online file sharing service (like Dropbox); or send the design file to yourself as an email attachment. If you don’t already have it, install the Home Outside mobile app on your device. Using your mobile device, tap the Home Outside design file icon and opt to open it with the Home Outside mobile app. How do open a design I created with the mobile app? Create a design using the mobile app, then use the Share button to email it to yourself to transfer it to your computer. Once the design file is in your personal files, use the Open From File button in the Gallery to select the mobile design from your Finder files. Rotate the screen view with the rotate view button in the upper-right toolbar to fit the desktop app and refine your design. Can I import my property plan or survey? Yes! 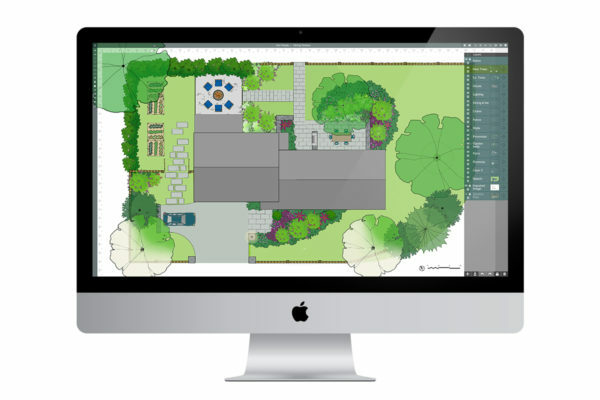 If your property plan is in JPG or PNG format already, you can import the image as a layer in your design. If you have a property plan or survey as a PDF file or in another format, first save your PDF as a JPG or PNG to your computer files. Use the Import Image icon in the Home Outside app’s left margin tools to select the JPG or PNG, your file will import as an adjustable image as its own layer in your design. The symbol at the far right of each Layer serves as a “handle” for dragging it to a different place in the list. Click on this symbol and drag the Layer up or down. The layers in the top of the list are seen above the layers below it. Adjust the layer transparency by clicking the checkerboard icon to the left of the layer’s name. My design is getting full and I’m having a hard time selecting an element without accidentally selecting other elements. Use the Lock Layers feature to avoid affecting certain elements inadvertently. Click the layer you’d like to lock then click the lock button at the bottom of the layers panel to lock in place all of the elements in that layer. A small white lock icon will appear on the preview thumbnail of your locked layer. To unlock, choose that layer again and press the lock/unlock button at the bottom of the Layers panel to unlock the elements on that layer. What’s the difference between saving a design file, an image (PNG), and a PDF of my design? When you save a design file, this saves your design in its current status outside the app so it can be transferred to mobile and edited, sent to a friend for editing, or saved in your personal files in case you accidentally delete it from the Gallery or uninstall the program. A design file can only be viewed if opened by the Home Outside app, whereas an image of your design can be seen and transferred like any photo. A PNG is an image of your design area without the titleblock, scale bar, or north arrow. Use the PDF tools to create a formatted 11×17” plan complete with project information, scale bar, north arrow, and your design notes. How do I update my Home Outside desktop program to the most recent version? If you have selected the auto-update setting in your Mac’s System Preferences > App Store, the Home Outside desktop app will automatically update when new versions are available. If not, manually approve program updates by opening your Systems Preferences panel, select App Store panel, click Show Updates, and click Update for the Home Outside desktop app. Will my design files be deleted if I update Home Outside desktop to a newer version? No! 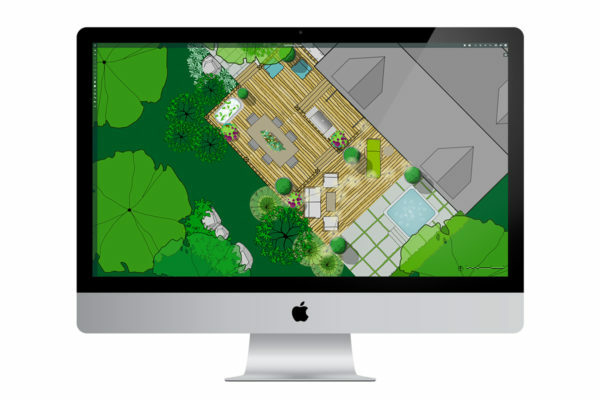 Designs created in Home Outside desktop will stay in your Gallery unless you use the app’s Delete button to delete them. If you perform a routine update of Home Outside desktop, your gallery designs will not be deleted. If you remove Home Outside Desktop from Mac’s applications dock, your gallery designs will not be deleted. Designs in your gallery would delete only if you delete the Home Outside desktop program from your applications folder. Home Outside desktop appears to be running slowly – what should I do? Try closing any other open applications, particularly other design programs, and/or try quitting and then re-opening Home Outside. Most other issues can be resolved by closing your design to return to the Designs screen, hover over the thumbnail of your design, tap Edit to reopen it. If the issue still doesn’t resolve, try quitting the app (click the red circle in the upper right of your program screen), wait a minute, then re-open the program. Your designs will be saved in your saved Designs when the app is closed and re-opened. If that still doesn’t work, hover over a design thumbnail in your Designs, tap the Save Design button to save an editable design file to your computer’s files. Then, delete the app from your Applications folder to uninstall. Re-install the app from your Purchased apps in your Mac App Store.